Despite the fact that our hotel was basically 2 blocks down and across the street from the train station, we decided it was worth the 50 rupee (under a dollar) tuk-tuk ride to help us get ourselves and our bags through the chaos of traffic, urine-soaked and broken up sidewalks, and tourist-hunting touts. Since we’d been there before, we knew where to find the sign displaying platform information and made our way to the one for our train. We walked up and down, looking for the sign for our coach number so we’d know where to wait, but found what seemed like every car number BUT the ones starting with A (for the 2nd class/2-tiered/2AC car we were in). We tried asking a couple of people, but nobody was sure. Eventually we found a board with printouts posted of all the cars and passengers’ assigned seats. We were happy to find our names listed, and by using the helpfully-listed information about the other coaches and their position from the front and the same information about ours, we extrapolated that we should wait out beyond where the awning ended. When the train arrived, we turned out to be right! Success! While we waited, we got many more stares. A short woman in a saree carrying a duffel bag on her head kept her eyes fixed on us even as she walked by. Impressive! Near us, groups of men standing around with impressive mustaches and groups of women sitting in beautiful sarees also kept their eyes on us. 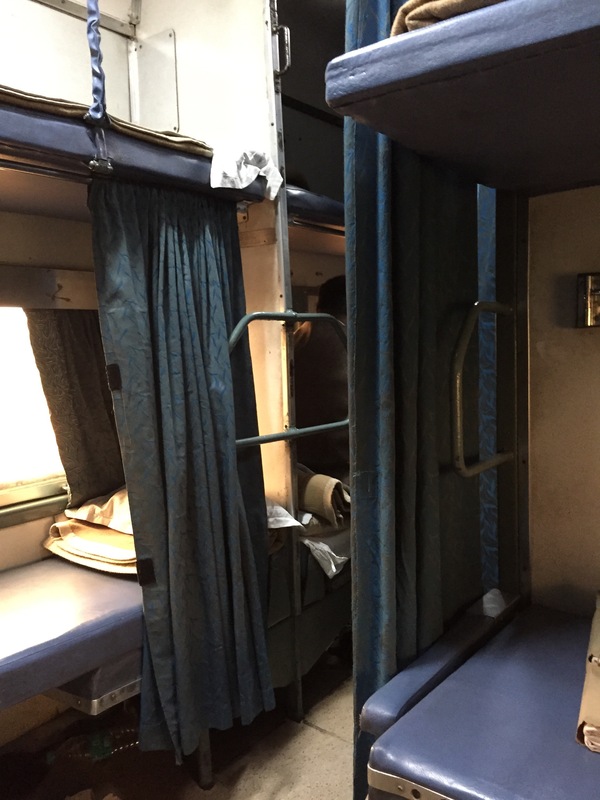 On the train, we learned that unlike on Thai sleeper trains, they don’t fold up the upper bunks during the day. Still, once our companion in the section showed us how to fold up the lower bunk to have a seat back (and enough headroom!) it was comfortable enough. 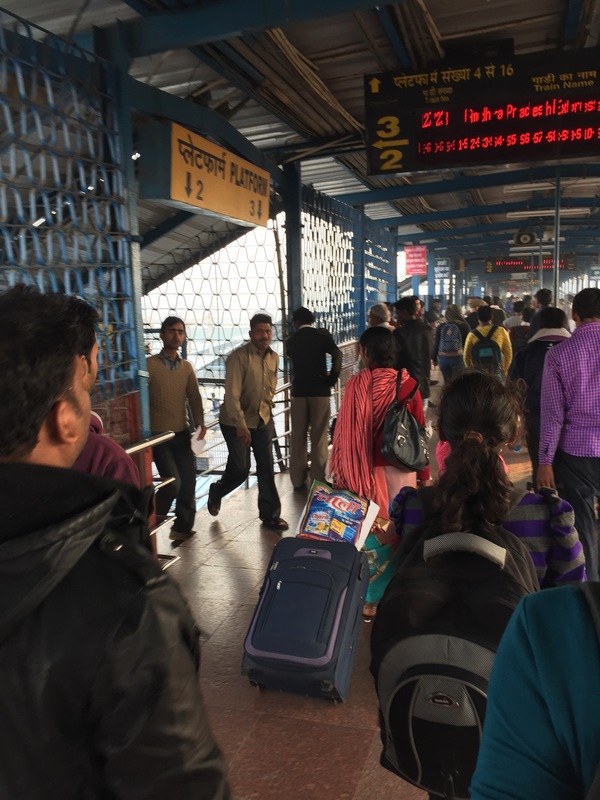 We chatted with him a little, and when we got to Agra, he was really kind in walking with us to the far end of the platform where there was a ramp (rather than steep stairs) which made it easier with our bags. He also pointed us at the fixed rate taxi stand so we wouldn’t get ripped off on the way to our hotel. 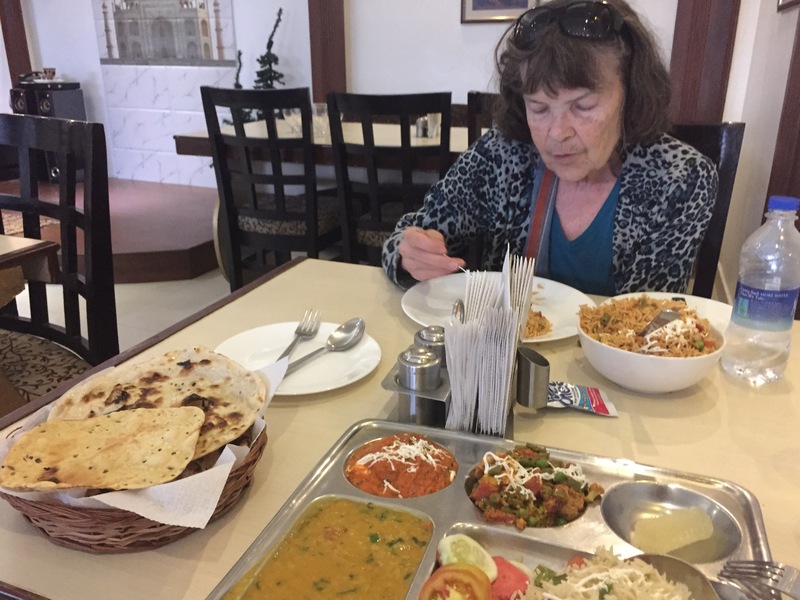 By this time, J’s cough (which we’d hoped was allergies to Delhi pollution) was leading to a full-blown cold with fatigue, and she was moving slowly, so we took our time. The taxi brought us to a busy street, parked, and we navigated a trip-hazard laden, raised dirt path back to the hotel. 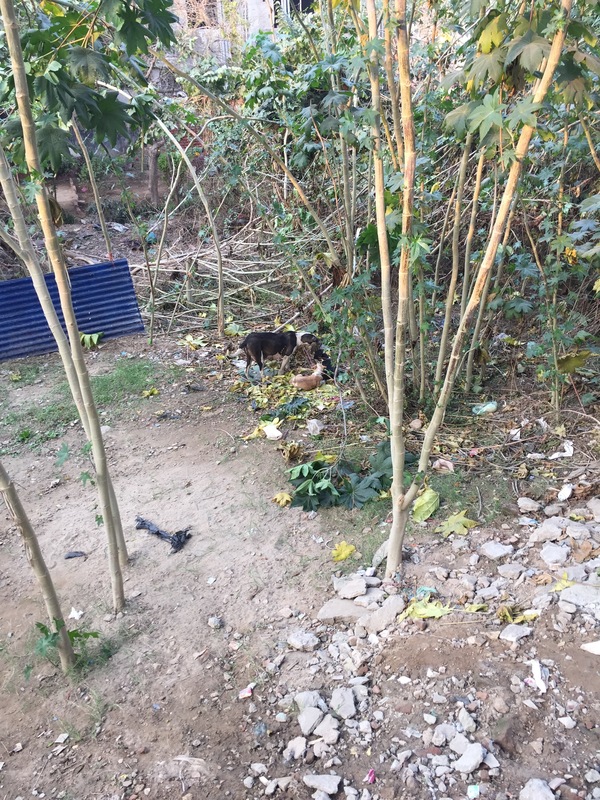 To either side of the path were dirt pits filled with garbage and, often, sleeping dogs. 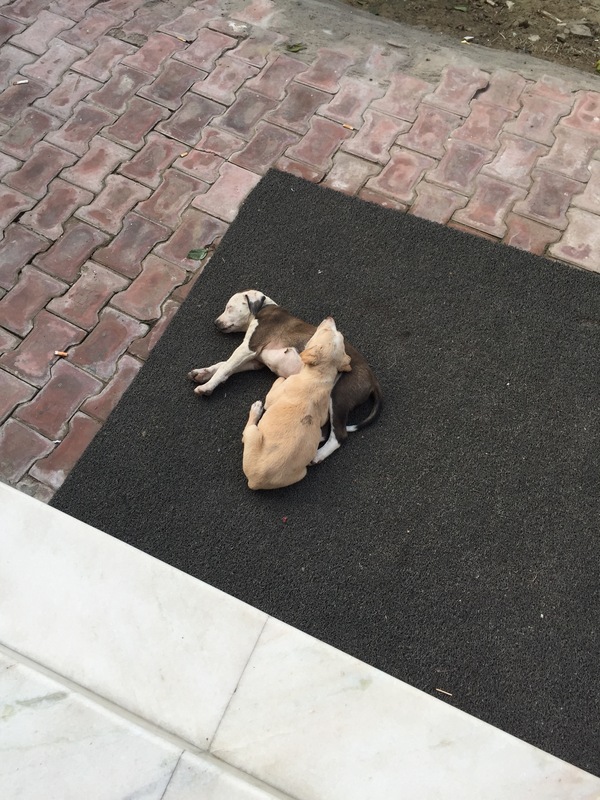 Just outside our hotel, we saw a litter of puppies napping in the sun. Street dogs. But cute! 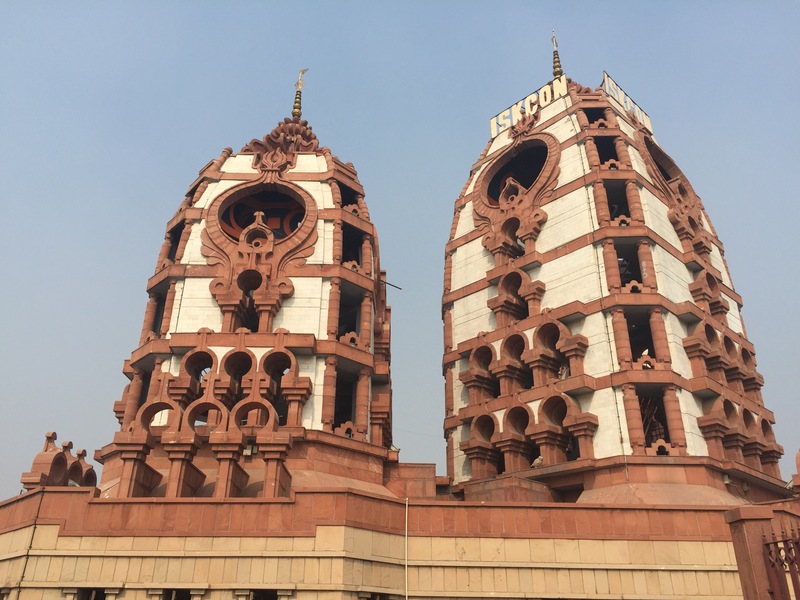 We talked with the hotel about getting us night train tickets to Varanasi, and they said there was a 99% chance they’d be successful. Okay! We had dinner at a rooftop restaurant on our side of the street. The stairs were steep and narrow and unfortunately were harder than usual for J, due to her fatigue. She didn’t eat much, but I enjoyed a paneer dish while watching and listening to the wedding party on the rooftop across the street. And then the power went out. 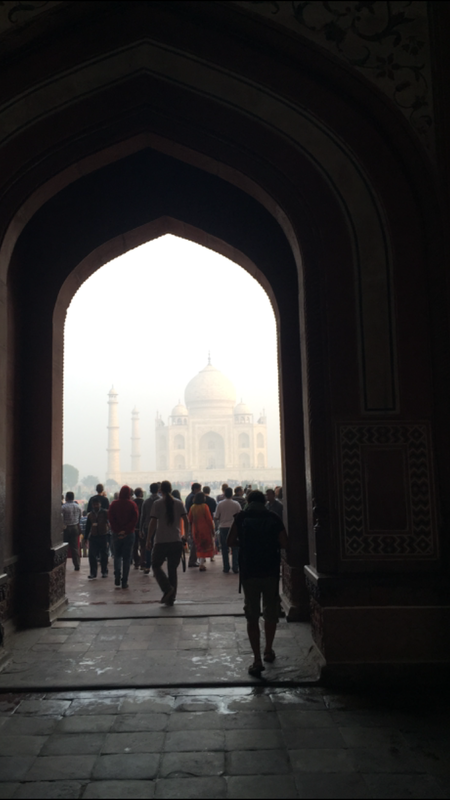 Up early to see the Taj Mahal. We walked to the nearby west gate but were surprised to find long lines both for tickets and to get in, since we got there so early. There were 4 separate entrance lines: General ticket holder ladies, high-value ticket holder ladies, general/men, and high-value/men. Indian resident tickets are much less expensive than tourist tickets. All the lines were together, with cattle gates between to keep people in their assigned lines. The lines weren’t moving at all and we probably stood there for a good 30 minutes. Meanwhile, J was feeling worse and worse, with waves of nausea and lightheadedness, but no way to easily get out or sit down. We talked about just coming back the next day, but her mind was set. We’re doing this. Today. Eventually, they started letting people in, we went through security, and we slowly made our way in. Crowded, but beautiful! Afterwards, we had breakfast at the hotel’s restaurant across the street and then rested for a bit. 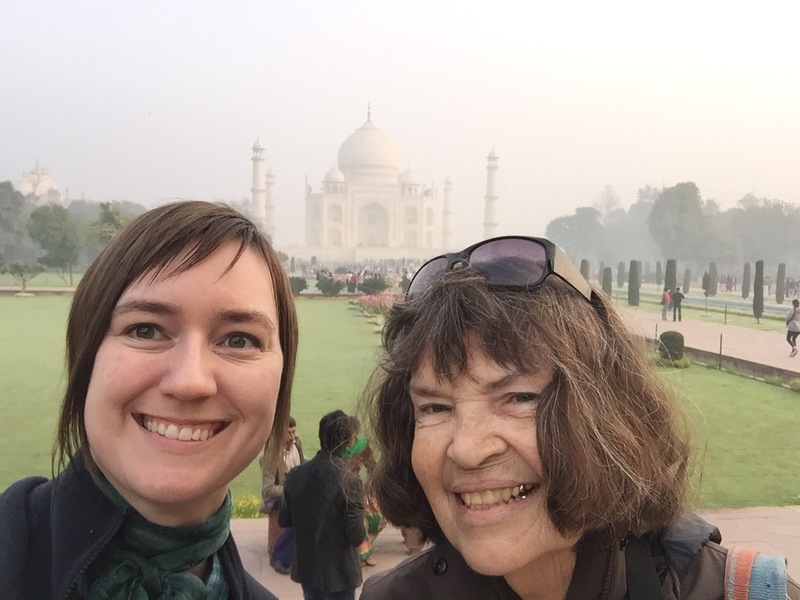 We decided we wanted to get away from the Taj Mahal & touristy area, so I looked at the map for another part of town with a lot of streets close together, found a nearby landmark, wrote down the name (“Kachori Ghat”), and out we went to find a tuk-tuk. It was a different world. Still crowded, but with cows and locals, not tourists. Narrow and winding streets. Tiny shop fronts and some food stalls (but none with seating). 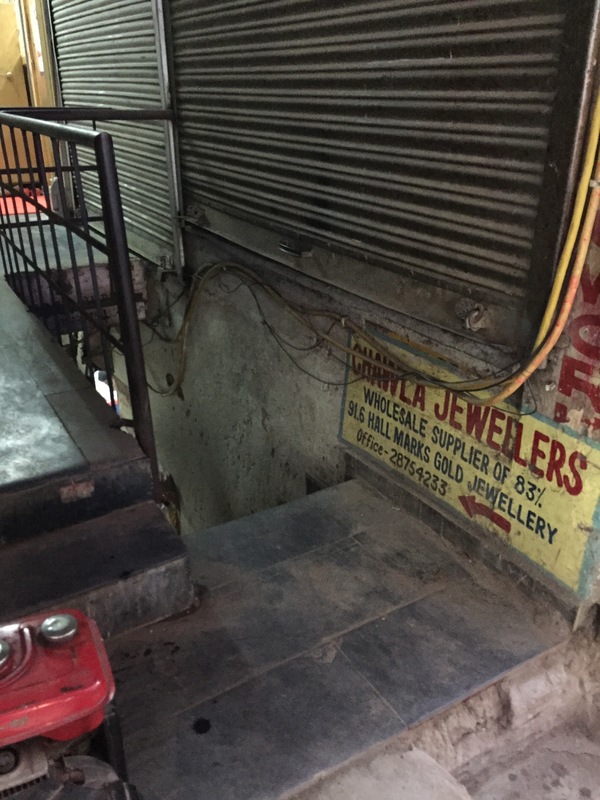 In some areas, we saw open sewers flowing just under the front porch/steps of buildings. A boy squatting down and peeing a perfect arc into one. Carts with beautiful displays of vegetables. Men in shops with stacks of flat cardboard outside to make into boxes. Stacks of boxes of sweets in the next shop. Men working on various machines. Flies. The smell of urine everywhere. Even smaller side streets with a band playing. Scooters weaving & honking their way through. 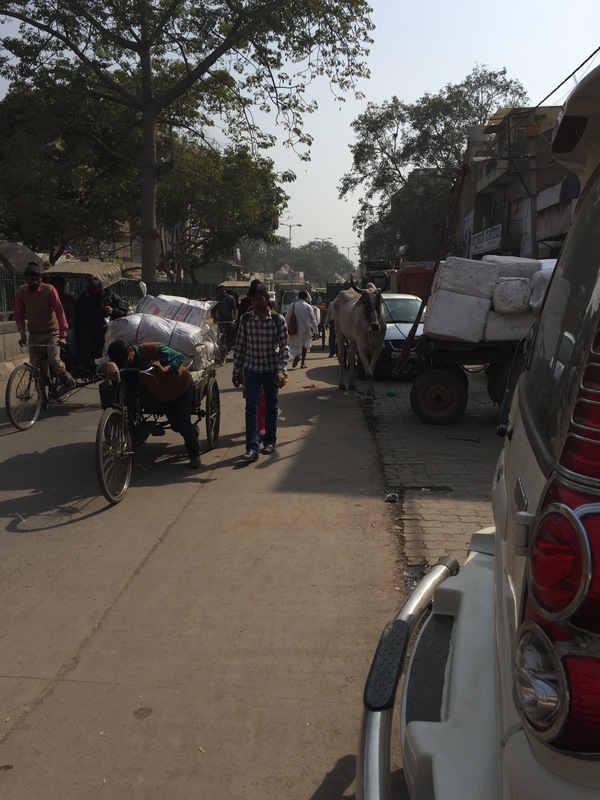 Streets too narrow even for auto rickshaws. When J got tired, people would invite her in to their shops to sit, or bring a bench down off their porch for her to use. A beautiful and colorful and busy place, but not one where I took many pictures. Nor a place where it seemed we were going to find what we wanted for lunch. 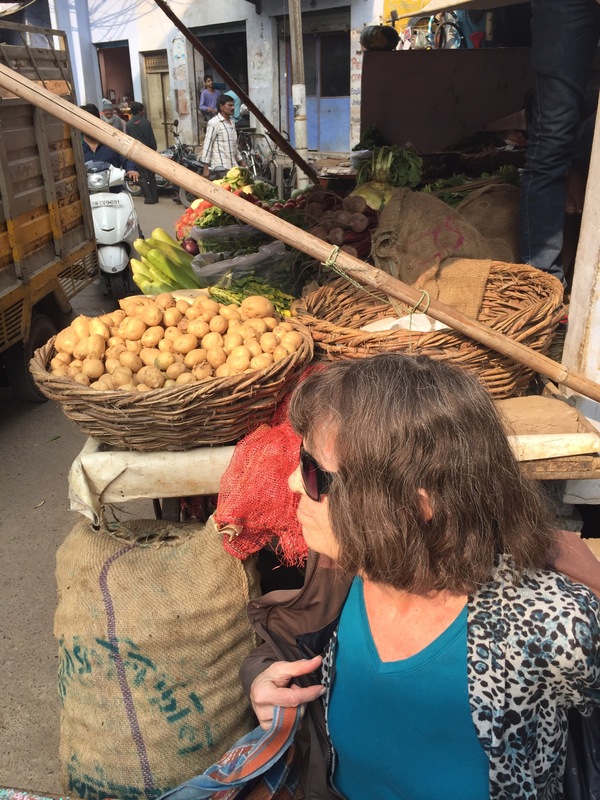 When we were ready to head back, there wasn’t an auto rickshaw in sight. We made our way to a busier area and I saw a shop with a few 20-something guys who I thought might speak English and be able to point us in the right direction to get one. After spitting out some tobacco, the guy behind the counter conferred with a customer/friend and one went out to talk with some folks outside. The answer: a bicycle rickshaw to some other part of town where we could get an auto rickshaw back to our hotel. We climbed in, and the rickshaw “driver” (rider? cyclist? captain?) carefully negotiated the crowds and rough streets. J and I were squeezed in tight, and I had to sit near the front of the seat so I could slouch down enough to avoid hitting my head on the canopy as we rode. The whole apparatus felt rather unsteady and as we went down a steep and bumpy hill and back up again, I asked J if she’d ever been mountain biking before! We tipped the driver handsomely for his hard work (you know, about 50 cents). He grinned and wanted to shake both our hands. Then, into an auto-rickshaw back to the hotel. We passed by the Agra Fort enroute and it looked quite impressive. On the list for tomorrow! A late lunch at ground level of the rooftop restaurant from the night before. 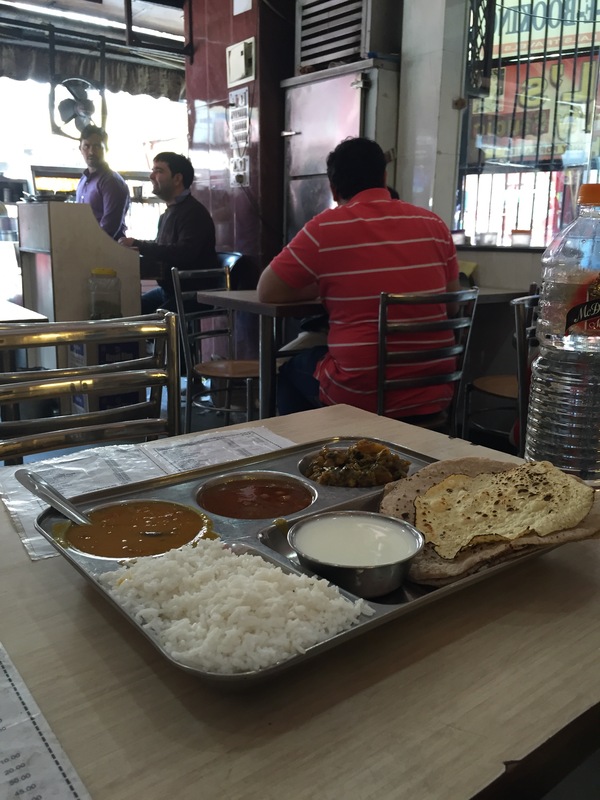 I enjoyed the thali and J had a biryani dish. The hotel people hadn’t been able to get the night train we wanted, but after some back and forth were able to get us on a different one that left later. Since it left around 11pm, I asked if we could keep our hotel room until that evening, as it would just make things easier logistically. Yes! Showers and early to bed. And then came the full body aches and the chills. Spent all day in bed. J and I both feeling horrible. Missed out on Agra Fort, but at least we recovered enough to make it to the train station by 10pm for our 10:55pm departure to Varanasi. Which turned out to be a 4am departure due to delays. At least we found a place to sit while we waited. Sometimes it’s the little things. Up early enough that we beat the breakfast crowds, we were able to try out the buffet (AND get omelets and pancakes made to order!) Some tasty things including savory mini doughnuts with a red broth, something like curry corn meal, and a porridge like cream of wheat. Tasty and filling. Stuffed silly, we set out for the lotus temple. 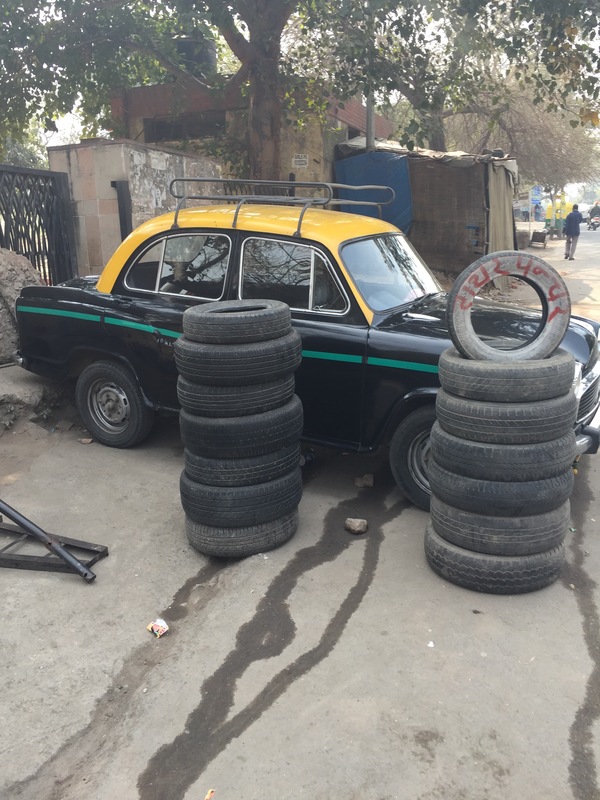 We asked at the hotel how much a rickshaw should cost and then went out to flag one down. Unfortunately, none wanted to take us there for that price. A man walking by suggested we take a rickshaw to some city center and catch a tourist bus from there, but that sounded annoying, so after checking our notes, we decided to try the metro! We walked back over to the train station and it was a complete zoo. Touts outside trying to tell us we needed to buy a ticket before we could go into the station (“I know that’s not true!” I said to one before brushing past him). Others tried to “help” us buy tickets but eventually actually pointed us in the direction of the pedestrian walkway over the tracks. So much more chaotic than Saturday had been. 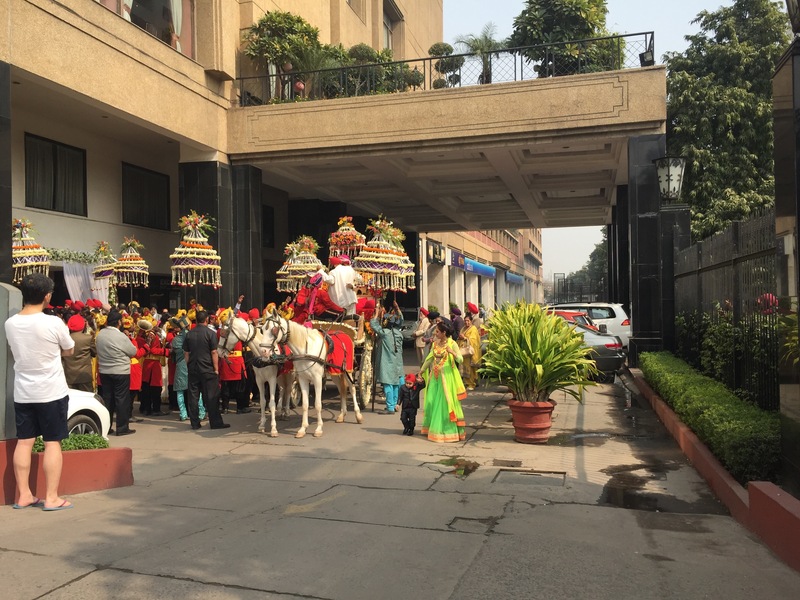 Turns out Delhi had given us a very gentle introduction on day 1! We made our way to the metro station and went down the stairs to find a mass of people standing around. None white, and very few women. We tried to buy tokens at a ticket machine but that option was greyed out so we waited in line at the counter instead. Took only mental pictures as it didn’t seem like the place to be pulling out an iPhone. After getting our tokens, we went through a security check (accidentally missing the sign for the ladies line, and being redirected accordingly). On the platform, we were trying to find a good place to wait (ideally near other women) but didn’t see many. We almost followed a woman who was walking purposefully down the platform, but we weren’t sure if she was heading for an exit or what, so we just waited near a family. Upon boarding the train, 2 young men sitting in a 2-seat section immediately stood up and let us sit down together. 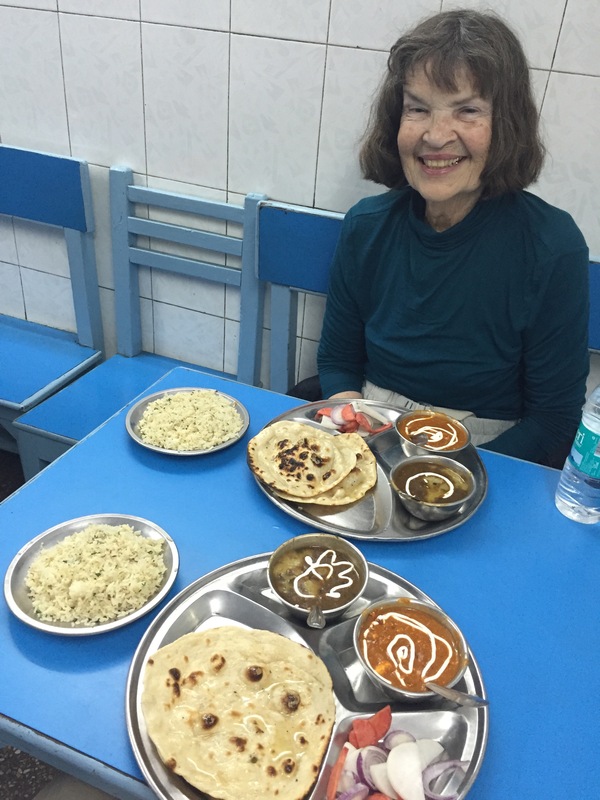 There are definitely benefits to traveling with a senior citizen! One of the guys was charging his phone from a plug above the seats and another helped hold the cord out of the way so it didn’t hit us. Despite all that we’d read about the metro, once we got inside, we felt quite safe (and maybe even a bit protected by these young gentlemen). We went just a few stops before getting out to transfer to another line. On the next platform, we saw signs for a ladies only car at the far end of the platform (aha! ), so we decided to check that out. We were both able to get seats, and settled in for the fairly long ride. Eventually the train went above ground and we could see the lotus temple and another interesting structure nearby. The station where we got out (Kalkaji Mandir) was much emptier than the station where we’d boarded. We walked down the stairs, out the doors, and (after a quick check of the map) followed people along a path and through a gate chained to be mostly closed, but with a gap about 2 feet wide to let pedestrians through. Then along a paved street to a metal arm gate that we ducked under. We turned and followed the street to the entrance to the temple. 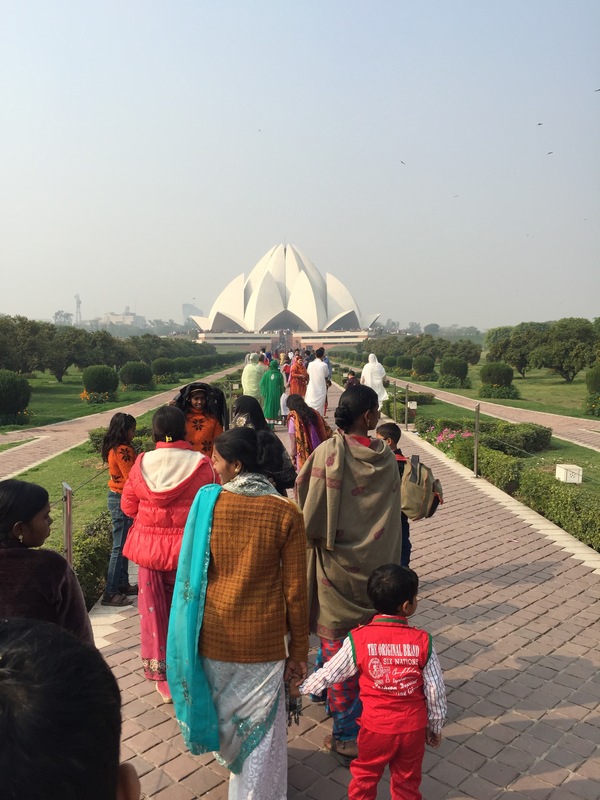 Inside, there were streams of (mostly Indian) people walking through the garden path, to and from the temple. Beautiful colorful clothes, some people walking with bare feet, and family photo ops all around. I didn’t see anyone taking selfies. About 3/4 of the way to the temple, a guard was handing bags to people and had everyone take off their shoes. We then took them down a half flight of stairs and bent down to hand them through an open window to some guys who gave us a token in return. A shoe check! Bare/sock footed, we slowly walked the rest of the way up to the temple. We followed the crowds to a line to go inside. No pictures or talking allowed inside, so we just enjoyed the quiet and the cool marble bench seats. After we went back outside, we sat on a bench and enjoyed the view. Quite a few people stared at us, and a teenage girl asked if she could have her picture taken with me. Um, okay, sure! A couple of her friends had to get in on the action, and J thought to snap a picture of us, as well. A few minutes later, another young woman asked to get a picture with me as well. Her English was pretty good, so I asked her why she wanted a picture with me (I was curious if it was my short hair, pale skin, height, weight, circus freak nature, or stunning beauty!) “To show my friends” she said. Alrighty then. 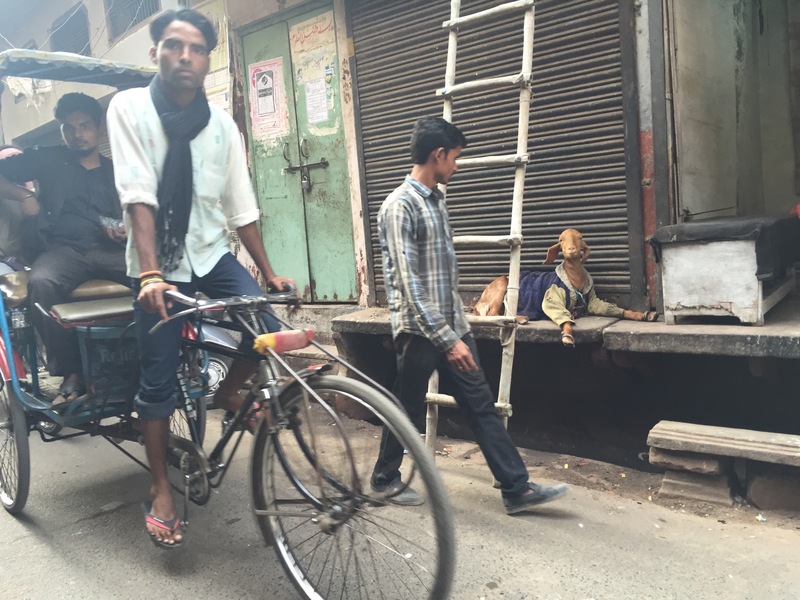 We looked up the information for the other (red) structure we saw and took a rickshaw there. Turned out to be a Hare Krishna place. After going through the ladies security line, we looked around a bit. 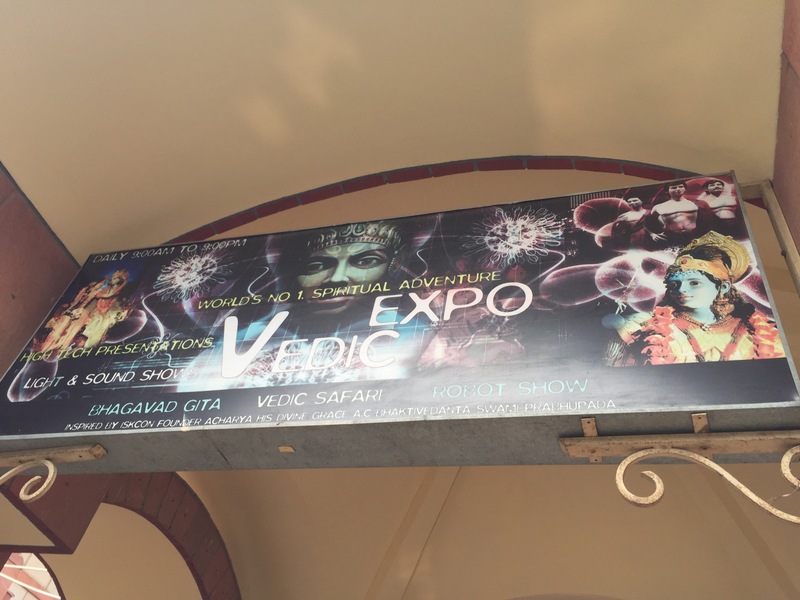 They had big signs advertising their Vedic Expo, which apparently is the “world’s no. 1 spiritual adventure.” I was intrigued by the “robot show” aspect of it, but at 300 rupees (about $5) per person it was ridiculously expensive, so we passed. We also opted not to go inside the temple (didn’t want to deal with the taking off of shoes & washing of feet and hands) so we just walked through. 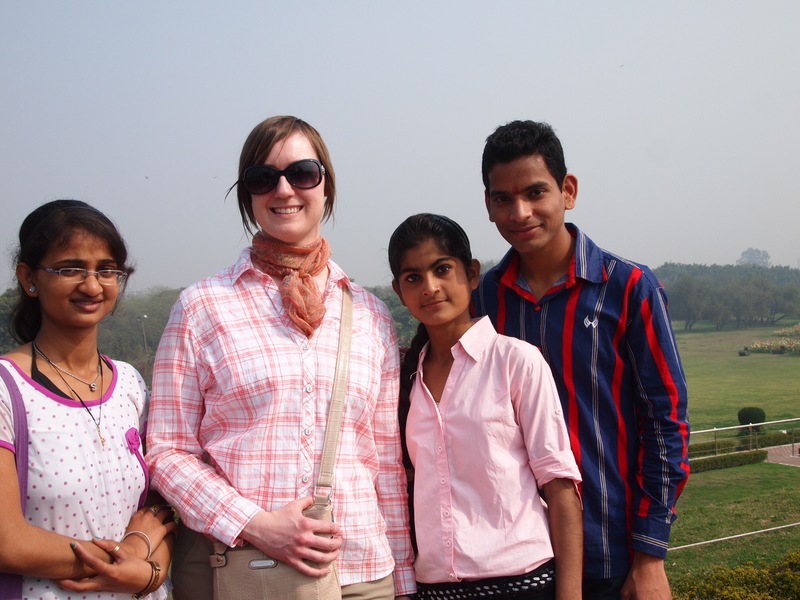 Outside, we sat on a bench and tried to figure out how to get back up to the Red Fort (the other end of town). We eventually asked for directions to the nearest metro station. On our way, we walked by a dusty park with people sleeping, and then a bit further came upon some fairly nice hotels and shops. At one hotel, we saw (and heard!) a wedding party, complete with brass band, flowers, and horses. The security guards saw us looking and invited us inside the hotel parking gates so we could have a better look. We realized that we’d probably ridden the metro earlier with one of the band members (the uniforms and French horn carrier/case were the same). We eventually got to the Nehru place metro (another quiet and easy to navigate station! ), found the ladies only car, transferred to another line where we needed to, and exited the Kashmere Gate station like pros. At this point, we realized, we had spent less than a dollar each, all day! By this time we were quite hungry and also a little tired from all the walking, so we didn’t want to just get street food. We wanted to sit. Unfortunately, we weren’t seeing any restaurants with seating areas. We walked for awhile toward the red fort but it wasn’t looking promising. We decided to flag down a rickshaw to take us the rest of the way. When the driver was trying to quote us far too much for the short ride, we kept going and another driver (an older Sikh gentleman) swooped in and took care of us. 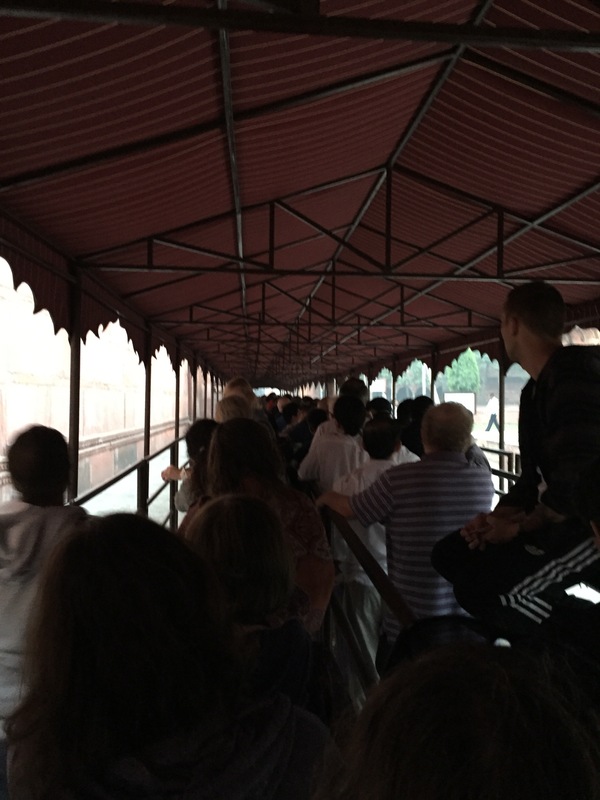 He dropped us at the red fort in short order, and it was crazy. Tons of tourists and streetside venders. Chaotic traffic (which we had to dodge when we realized that the other side seemed more likely to have restaurants). Walking, walking, walking. Lots of stuff to buy but no sit-down restaurants to be seen. A woman who was asking us for money (which we didn’t give) then kindly pointed us in the direction of where we might find another rickshaw, anyway. The second time that day we’d been helped by people who we’d been in the process of rebuffing. Kinda made me feel like a heel. Back to the hotel and a late lunch at the nearby cafe that had been recommended by the English women at breakfast the other day. Quite decent pizza, but significantly more expensive than the other meals we’d had. Back at the hotel, we caught up on email and decompressed for a while. 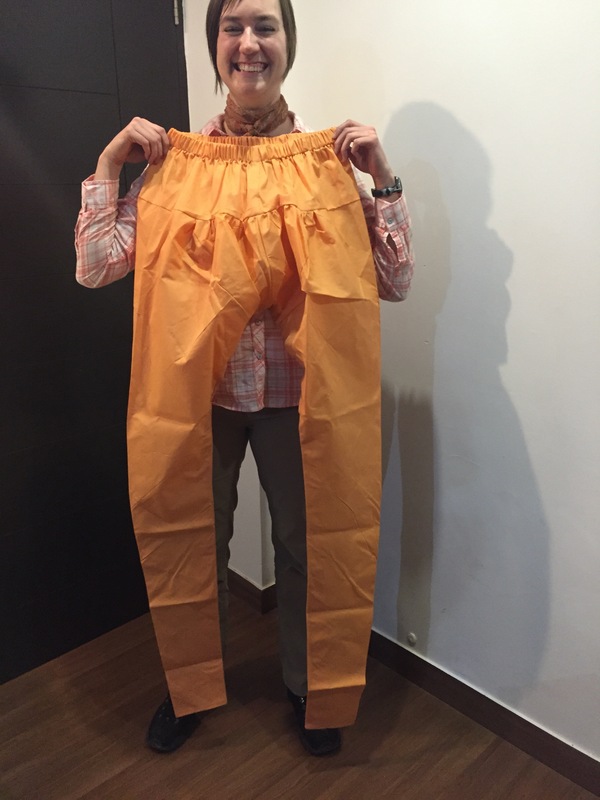 Around 5, I had the hotel front desk call the tailor to see if they could deliver my new clothes (something they had offered to do). They were short handed, though, so we got into the nicest (newest) rickshaw yet, driven by a sharply dressed young man. When we got close, he asked for the business card again and called the tailor/shop guy to ask for specific directions. He had stopped the rickshaw while he was on the phone, and after a minute or so, the tailor came out with my new clothes in hand and delivered them right to us! We confirmed they were the right pieces, I paid him the balance due, and he signed off on the talley on the back of his business card, which was effectively my receipt. We’d thought of having dinner in that area (Karol Bagh), but decided to take advantage of our nice rickshaw & driver, so just had him take us back to the hotel. My new pants make me giggle each time I see them! 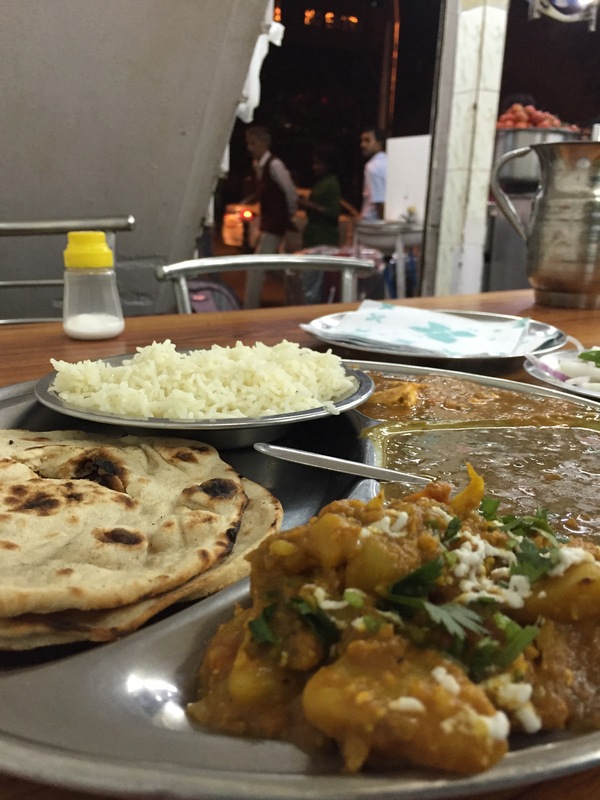 We walked back near the railway station and selected a different vegetarian restaurant to try. This one had an upstairs, and when we got up there, we were all alone. Not a good sign for a restaurant but we decided to give it a try. And if nothing else, we wouldn’t be stared at! The food was super tasty (perhaps the best yet) and super reasonably priced. Yay! 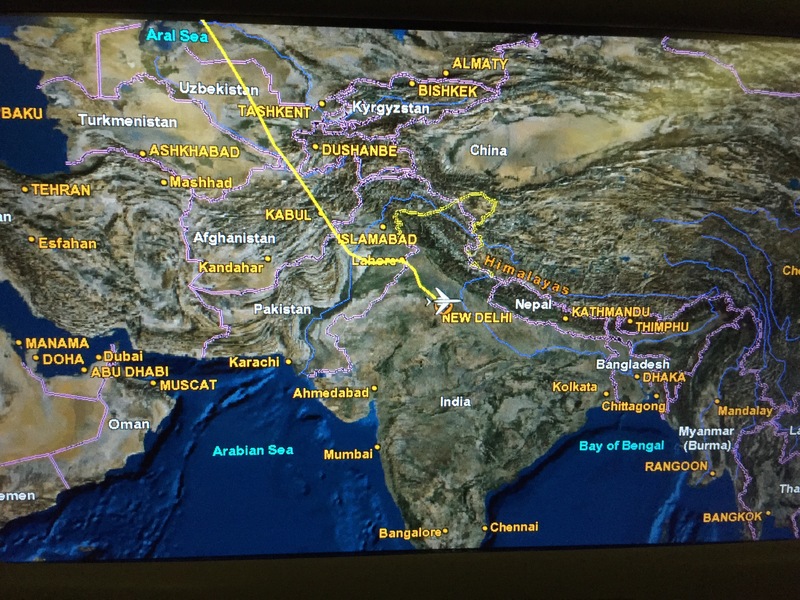 We landed at the Delhi airport on time, but getting through immigration took hours. First, our flight had not been provided with the landing card forms, and then they were running short, inside. We finally got one of the forms, but couldn’t find the other. We decided to wait in line anyway and when it was our turn, were told that we needed to go to a different area for the visas on arrival. Eventually we made it through, stopped at an ATM, and found our driver who had been getting antsy. The drive from the airport was interesting. Our driver hated traffic so took some interesting turns (u-turn on a one-way street since he didn’t like the jam up ahead, etc). Then, he said we needed gas. We pulled into a cement barricaded aisle where we were queued up behind a few other cars. Then, when we pulled up to the pump, the driver had us get out. We were standing just next to the car, keeping an eye on our bags while everyone else at the station was keeping their eyes on us. It was well after 11pm at this point. It didn’t feel “right,” but things turned out fine. Our driver eventually came back around to our side of the van, we piled in, and he drove us the rest of the way to the hotel. After our late night arrival and a pretty good nights sleep, we woke up to dogs barking outside. Showers were good (after waiting the recommended 5 minutes for the water to get hot), and my “shower shoes” (cheap flip-flops) came in handy as the shower was the entire bathroom, not a separate stall as the website pictures had indicated. 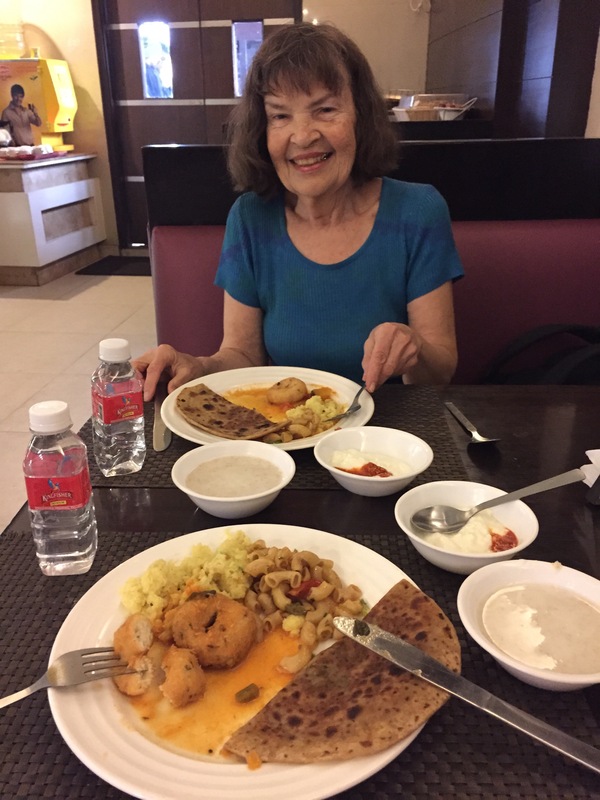 We went up to breakfast on the top floor and started to look over the buffet, but it was busy and we were shepherded to a table where we got the full service treatment. I ordered a “masala omelet” (came with peppers inside) and we both got plain “pancakes” that were more like crepes, along with a fried dough bread and another crispy crepe filled with curry vegetables that we hadn’t asked for, but enjoyed. I ordered chai/milk tea and J got some coffee with milk (which was sweet). And with that, we were as ready as we were going to be, so we set out for the train station. Of course, we had forgotten the simple instructions of how to get there, so we took a circuitous route, passing by open-air sidewalk-side urinals and walking up and back down stairs of a pedestrian bridge we didn’t need to take. We eventually found the tourist ticket office and dutifully took a number to wait our turn. It was very DMV-like. While we waited, we filled out some forms for the trains we wanted. When our turn came, we were told that unfortunately there were no tourist allotment tickets for the Agra to Varanasi night train we needed, but the agent suggested that we (or someone from our hotel, on our behalf) should go to the station the day before our trip at 10am sharp, when some last-minute “tatical” tickets become available. He seemed pretty sure that we would be able to get tickets that way. Let’s hope so, or we’ll be stuck in Agra during a festival when the hotels are full! 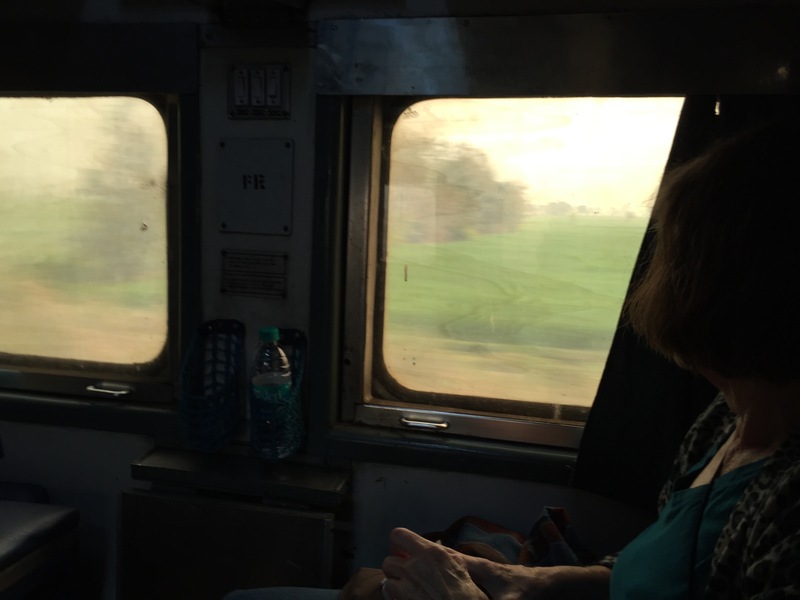 We went ahead and got our day train tickets from Delhi to Agra while we were there. After getting tickets, we wandered around the city. J wanted a cellphone so we stopped in a few places to enquire. The phone is easy, but getting & activating a SIM card may not be. One place wanted her passport (hopefully just a copy?) and said we would pay them now, but that the phone wouldn’t be active until 6pm. That may be normal but we wanted to shop around a bit and, if the 6pm thing is true and not a scam, find a shop closer to the hotel just in case there were any problems. For lunch, we found a little open-air vegetarian restaurant with some tables and chairs inside. Pretty tasty and very cheap. I was surprised to see the server shoveling rice from the pan onto plates with his bare hand. There was a sink (with soap) right up by the cooking area though, so hopefully he used that! Our meals came with spoons, so we didn’t have to shovel the rice & sauces into our mouths with our bare fingertips like the guy at the table next to us. I’ve eaten with my hands a fair bit, but usually there’s some sort of bread involved! We wandered around a bit more after lunch. Through some crowded areas and some not. Some very narrow alley-like streets with scooters beeping through them anyway. Past cows sleeping on one side of the street, and dogs napping on top of a (covered) car on the other. 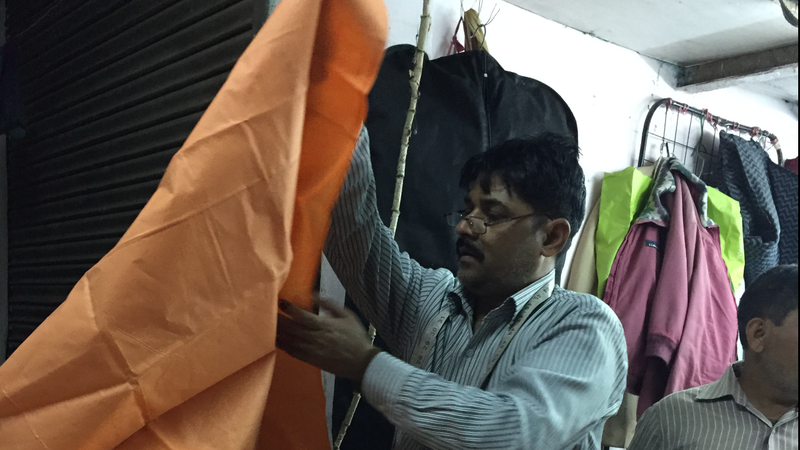 One thing we hadn’t seen was a tailor where we could have some Indian clothes made. We asked at the hotel and got a list of areas we could shop in. We took our first auto-rickshaw there. Each shop we went to, they went crazy bringing out things for us to look at — most of which were not at all what I wanted, so I felt bad and just wanted them to stop taking everything out. They were just going to have to re-fold it all! Eventually I saw one that caught my eye. It wasn’t a tailor shop and they had a lot of premade clothing, but the set I liked was just fabric. After some back and forth, I explained that I needed to have it sewed too. They could help me with that, and another guy came over. I didn’t negotiate enough on price, but it was still super cheap so I went ahead and put down a deposit (half now, half when I get the finished clothes) and followed the guy down an alley and then down some narrow cement stairs to a hole in the wall with 3 guys and a sewing machine. They took my measurements (I remembered to take a deep breath in, to expand my lungs, per my sister’s recommendation!) and also asked me some questions about how I wanted it made. There was a bit of a language barrier, plus I’m not up on Indian fashion, so I didn’t know how to answer some of the questions, but I’m excited to see what I wind up with! 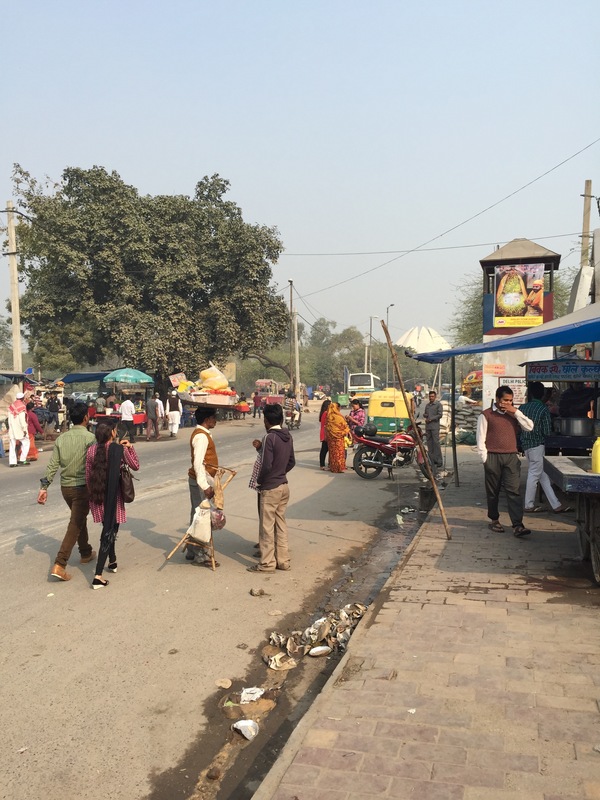 We walked a bit further before deciding to make our way to Dilli Haat, and flagging a rickshaw. The first one that stopped had a shady driver, but the second one was great. Not only did he quote us a reasonable price up front (and refused to bargain, instead simply saying, “no ma’am, this is a fair price”), but he was a really excellent driver. I wish in retrospect we’d asked for his card. Anyway, we got to Dilli Haat and browsed the crafts for sale, but the longer we were there, the less interesting it became. More and more of the same things at every shop, and the workers were really losing us with their hard sell tactics. We took another rickshaw back to the hotel. By this time, it was dark out and quite chilly when zipping down the street. The fumes were pretty bad after awhile and we were glad to make it back to the hotel. We decided to walk over by the train station for dinner, and found a really great little restaurant (all vegetarian) but I don’t think I’ve ever been stared at so much in my life. Not sure if it’s because we’re western, women out after dark, or what. The food was fantastic though. All in all, a good first day!